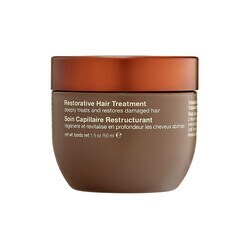 I purchased the “Damage Reverse Restorative Hair Treatment” by Ojon as a sale item at the MAC Warehouse sale(blog + pics here: http://wp.me/p2efXc-1w) back in March. It was one of the many items in my haul that I was super excited to try. It was a steal: I purchased the 50ml size for $4 which normally retails for $22 here in Canada. Now I have curly hair. Curly, ringlety hair. It’s not to thick, it’s not at all coarse, but it does get dry. Especially since I have caramel hilights. And we all know what dyeing can do to already dry hair. I tried this product on dry hair, as it recommended. I took small teaspoon sized amounts into my hands, melted the waxy substance by rubbing it together in my palms, applying the oil to the hair, and repeating until fully saturated. It took about 1/4 of the jar to ‘fully saturate’ by mid-back length dry, damaged, and normal-thickness hair. I combed it through, put on a disposable shower cap, went under the blow dryer for 5 minutes, and let it sit for about 2 more hours. Afterwards, I washed it out as normal with my sulfate free, argan oil-infused shampoo and conditioner and proceeded to blowdry and flat iron my hair. My hair did not feel softer, smoother, more hydrated, or in any way healthier than before using the treatment. In fact, my hair felt hard and straw-like. I was not impressed. I would have been better off applying warm coconut oil, palm oil or olive oil to my hair as a conditioning treatment instead of using this product. I would actually say that this is the worst hair product of it’s kind that I have ever tried. It smelled like cigarettes & chocolate (very odd combination), it was time consuming to apply and use, and it did not yield any of the results it promised. I also used 1/4 of the product in a single use, which means for $22 you’re getting 4 uses out of this product on the average head of hair. I can get more uses out of a bottle of coconut oil at the West Indian Grocery Store and it would cost me less than half of what this product is priced at. The good thing about this experience? Well, there are 2 good things: One, atleast I’ll be able to attract every nicotine addict and chocolate-loving child within a 5 mile radius based on the aroma of my hair and Two, atleast it only cost me $4 to make this mistake. Coulda been much worse. Have you tried this product? Let me know what your experience was and what you thought of it! My “Incredible” New Favourite Thing!